PAKISTAN is fast becoming the destination of choice for Malaysian investors with its "lucrative incentives", revealed a study by several Malaysian businessmen following a recent visit to the republic. Datuk Mohamad Salim Fateh Din, who is the honorary investment counselor of Board of Investment of Pakistan based in Malaysia, urged property developers to be among the first to tap Pakistan's construction market due to the strong demand for modern property developments. "There is immense scope to grow existing volume of trade between both countries as well as invest with Special Economic Zones exclusively for Malaysian investors," he said at a briefing in Petaling Jaya yesterday. The Board of Investment serves as a facilitator to Malaysian investors. Mohamad Salim had visited key cities in Pakistan like Islamabad, Karachi, Lahore and Faisalabad as part of a high-level Malaysian delegation to explore trade and business and investment opportunities. It found that the environment there is ideal and safe for investors. During its week-long stay in Pakistan, the delegation visited various industrial sites, met with the political and economic leaders and held talks with top business leaders to establish business to business networking. The large consumer market of Karachi with its 15 million population and Lahore with its eight million population both have robust purchasing power, giving rise to the presence of international hypermarket brands. "Medium-scale shopping malls with integrated family choices offers another investment potential as there is a huge vacuum in this market." High rise condominium lifestyle has also caught on in these cities and Malaysian developers can have a joint venture with Pakistani counterparts in the construction. High Commissioner Lt General (Retd) Tahir Mahmud Qazi said Pakistan has a lot to offer to investors, especially in engineering, power, horticulture and manufacturing sectors. "Pakistan offers incentives to Malaysian investors such as duty-free import of capital goods, allotment of land for factories with 50 to 100 year lease, one stop approval and protection for investors through an act of Parliament." For the first five months of this year, Malaysian exports to Pakistan totalled RM2.45 billion from RM2.58 billion in the same period in 2008. There are currently 14 Malaysian companies in Pakistan actively engaged in infrastructure, housing, roads, energy and solid waste management. GEORGE TOWN: Double-storey terrace houses and properties priced around RM200,000 are making a comeback in Seberang Prai. Henry Butcher Malaysia (Seberang Prai) senior manager Fook Tone Huat said in early 2003 and 2004, 2½- to three-storey houses were popular as purchasers sought bigger space for their families. 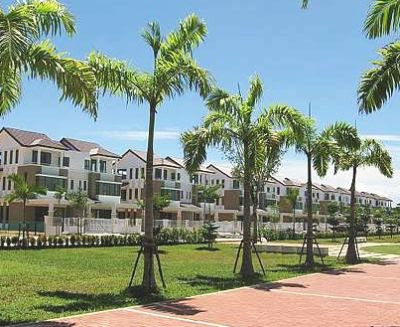 “The built-up areas of such properties start from 2,200 sq ft and when first launched, they were priced from RM280,000. Today, these properties are priced between RM350,000 and RM380,000. “Last year, when the global economic crisis set in, developers started developing double-storey houses, as buyers now have a lower budget,” he told StarBiz. With a built-up area of 1,500 sq ft, the double-storey properties were priced from over RM200,000, depending on location, Fook said. “Such properties on the mainland generally appreciate by about 10% annually. We are also seeing a new range of affordably priced high-rise properties with theme park facilities being planned for the mainland, that are normally found only on the island. These condominiums are priced between RM170,000 and RM190,000,” he said. Fook said developers should look into introducing the 5:95 easy payment plan, which allowed buyers to pay just 5% for the property and the remaining 95% upon completion of the project. This easy payment scheme, although popular on Penang island, had yet to be widely implemented for projects in Seberang Prai, he said. The Seberang Prai property market in the second quarter showed no improvement over the preceding quarter and was expected to remain sluggish into the third and fourth quarters, he said, adding that sales were anticipated to pick up early next year. Fook added that for the past two years, the development of new property projects had shifted from Raja Uda and Bagan Lallang in north Seberang Prai and Bukit Mertajam in central Seberang Prai to Bukit Tambun and Simpang Ampat in south Seberang Prai. One Asia Property Consultants (Penang) Sdn Bhd managing director Najihah Md Noor said the soft property climate offered buyers a wide range of choices. “It is the buyer’s market. They can pick from the new launches which normally offer freebies for the properties such as kitchen cabinets and air-conditioners. “Buyers can also get value for their money from auctioned properties which are sold below market value,” she said. The banks’ offer of ultra low financing loans last month had also brought some improvement in the market, she said. Developers launching new double-storey terrace and higher-end condominium projects on the mainland include Asas Dunia, Tambun Indah, DNP Land Sdn Bhd and new player Landmark Strategy Sdn Bhd. After a hiatus about six months, Asas Dunia is now launching some 1,177 landed properties in central Seberang Prai. Asas Dunia managing director Datuk Jerry Chan said about 50% of the new launches were terraced properties priced between RM130,000 and RM250,000. “The other 50% are semi-detached houses and bungalows, priced at RM280,000 to RM350,000 for the former and RM350,000 to RM450,000 for the latter,” he said. Chan said the group was resuming its property launches because sales had picked up in May and June. “We are also confident that there is commitment to complete the second bridge on schedule by 2012, after seeing substantial progress made on construction work,” he said. DNP Land general manager K.C. Tan said the company would, in the fourth quarter, launch 338 properties, comprising 200 double-storey terrace houses and 138 semi-detached houses and bungalows, for the BM Utama project in Bukit Minyak and Taman Sri Impian in Bukit Mertajam. The double-storey terrace houses are priced from RM250,000 while the semi-detached units and bungalows start from RM400,000. “We will develop a five- and four-acre park respectively for the BM Utama and Taman Seri Impian schemes, which will be properly landscaped and equipped with the appropriate amenities. “We will also construct a 90,000 sq ft commercial centre in Bukit Minyak, located between the two projects,” he said. Meanwhile, Tambun Indah and Mutiara Goodyear Bhd are offering 600 terraced, semi-detached and bungalow units at its Pearl Garden scheme with an estimated gross sales value of over RM200mil in Simpang Ampat, south Seberang Prai. Landmark Strategy Sdn Bhd is developing the 952-unit Pinang Laguna Theme Park Condominium with a gross sales value of RM160mil on seven acres in Seberang Jaya. The units are priced between RM170,000 and RM220,000 for built-up areas of 950 to 1,100 sq ft.
Business development manager Michael Cheng said the project would be equipped with theme park facilities. “There will also be a clubhouse with spa, gymnasium, sauna and outdoor jacuzzi,” he said. The four-star Concorde Hotel Kuala Lumpur will undergo a RM40 million facelift over the next three years to be among the first to benefit when the economy recovers. The project has been divided into three phases. Phase 1, which is currently underway, saw the closure of five floors of the hotel on June 15 for the refurbishment of 207 rooms. The project's first phase will cost RM5 million, said its director Tan Sri Syed Yusof Syed Nasir. It has allocated another RM15 million to refurbish the remaining 363 rooms and the rest to refurbish its support facilities such as the ballroom and gallery meeting rooms over the next two years. "Once completed, the hotel will feature comfortable room layout, exquisite carpet and wall coverings, spacious dressing area with bathrooms with the latest in shower offerings," Syed Yusof told Business Times in Kuala Lumpur recently. "The rooms are redesigned not only to satisfy the demands of the discerning, but also to nurture and inspire the individual," he said. Syed Yusof said while the current global economic slowdown has affected the hotel's occupancy levels, it has also brought benefits in terms of lower building material prices. This in turn has lowered construction costs. "The good thing about this recession is interest rates are down, costs of raw materials are falling, and crude oil prices are down. When things are down, it will be a matter of time before they head back up. So we believe in spending now," Syed Yusof said. 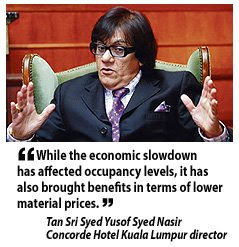 He said Concorde Hotel Kuala Lumpur remains on track to meet its 2009 revenue of RM60 million. "We saw a slight shortfall of 5 per cent in all our hotel properties against our revenue in 2008. But looking at the second quarter, things should improve and there are signs showing that," he added. The 19-storey Concorde Hotel Kuala Lumpur, formerly known as Merlin Hotel, on Jalan Sultan Ismail features 570 rooms with a strong domestic clientele. Syed Yusof and his business partner Ong Beng Seng, founder of Singapore's Hotel Properties Ltd (HPL), bought the property in 1990 and refurbished it for some RM100 million. No major refurbishment has been carried out since then, Syed Yusof said, adding that the hotel spends three per cent of its annual revenue on maintenance. Concorde Hotel Kuala Lumpur's occupancy currently hovers around 80 per cent to 85 per cent, with an average room rate of RM250 per night which it expects to maintain throughout this year amid the renovations and economic slowdown. Meanwhile, the Concorde hotel chain also has plans to refurbish the 14-year-old Concorde Inn Sepang for RM4 million in the second half of 2010. "When we upgraded Casa del Mar in Langkawi and Concorde Hotel Shah Alam for RM10 million last year, sales shot up. We expect the same (results) from Concorde Hotel Kuala Lumpur and Concorde Inn Sepang," Syed Yusof said. INVESTORS should buy Malaysia’s construction stocks as they will outperform the market this year with the government’s accelerated spending on “mega projects,” said Terence Wong, an analyst at CIMB Investment Bank Bhd. “Construction is the must-own sector in Malaysia because pump-priming will come through and it will come through aggressively over the next few years,” he said in Kuala Lumpur today. There will be “enough contracts to go around for all companies,” he added. The government is expected to roll out as much as RM80 billion ringgit worth of infrastructure projects in coming months that may include the extension of the Klang Valley Light Rail Transit, Wong said. Prime Minister Najib Razak, who took office on April 3, announced stimulus plans valued at RM67 billion (US$19 billion) to restore growth. The Kuala Lumpur Construction Index of 42 stocks has gained 27 per cent this year, compared with the benchmark FTSE Bursa Malaysia KLCI Index’s 24 per cent advance. The construction measure is trading at 39 times earnings, almost twice the benchmark indexes’ 19.6 multiple. Wong’s top picks in construction include Gamuda Bhd, IJM Corp and WCT Bhd. These so-called “mega projects” are “starting to come on,” he said. In May, the government gave out a RM1.3 billion contract to build a tunnel for the Pahang-Selangor interstate water project. Shares of IJM, which is helping to build the tunnel, have more than doubled this year. Shares of Gamuda, Malaysia’s second-biggest builder, surged 49 per cent and WCT advanced 53 per cent. DUBAI: The average office rent in Dubai is e995 (e1 = RM5.02) per square metre per annum, making it the second highest market rate in Europe, the Middle East and Africa (EMEA), according to research by CB Richard Ellis (CBRE). CBRE’s Office MarketView (Q1 2009) showed that London’s West End topped the list of the most expensive office rents at e1,019. Moscow is ranked third at at e906, followed by Paris at e700 and St Petersburg at e657. CB Richard Ellis Group is a commercial real estate services firm headquartered in Los Angeles. CB Richard Ellis Middle East associate director of research Matthew Green said despite the much publicised downturn in the Dubai market, prime office rental rates remained comparatively high and second only to London’s West End. “However, with a significant portion of supply still to enter the market this year we are likely to see further rental reductions as landlords compete to secure tenants,” he said in a statement.